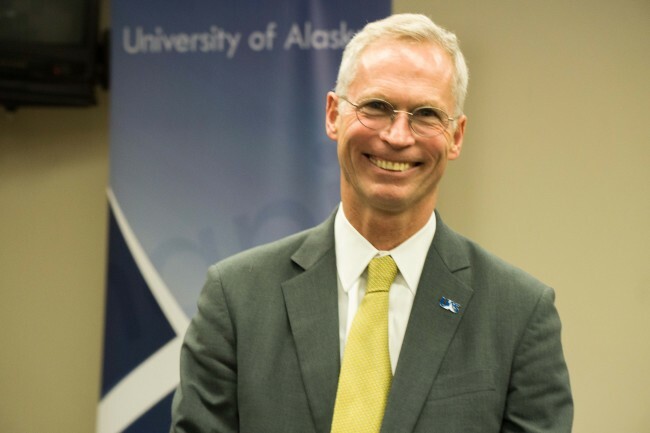 University of Alaska President Jim Johnsen is touting a restructuring plan called “Strategic Pathways” as a way to save the state money. The plan, presented to the Board of Regents last week, would reorganize the system into three “lead” universities, but it lacks specifics about how much money it would save, or which programs might be on the chopping block. Johnsen told reporters today it’s in the University’s interest to withhold those details for now. Johnsen also fielded questions about a proposal by Rep. Tammie Wilson that would cut the University budget from the $331 million dollars in the Governor’s budget down to $288 million. Wilson told the House Finance Subcommittee last week her budget plan only contains money for what the University considers “student instruction.” It would eliminate funds for research and for outreach programs like the Marine Advisory Program. Johnsen is headed to Juneau this week to meet with lawmakers and defend his Strategic Pathways plan, which is meant to take shape over a three-year period. He said a dramatic budget cut like Wilson’s would force the process to go much more quickly… and would make for a much leaner institution. Johnsen said the university has provided Wilson with “extensive information” about the types of research conducted at the University. The Fairbanks Daily News-Miner is reporting Wilson has put the University budget on hold while she seeks a more detailed breakdown on how research is paid for and who it benefits. The subcommittee had planned to finish its work on the university’s budget Tuesday. The next meeting is scheduled for Wednesday at 7 p.m.